A cannabis dealer lost control after taking a “nasty” new psychoactive substance and bit a police officer. Mark McAteer (42) believed he had taken Valium, but it turned out to be a so called “legal high”, which he had an adverse and violent reaction to. 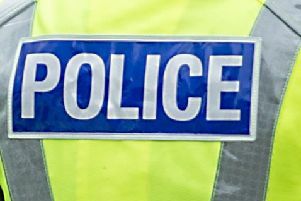 McAteer appeared at Falkirk Sheriff Court last Thursday having admitted the assault he committed at in Glasgow Road, Denny and resisting police officers and being concerned in the supply of class B drug cannabis in Overton Crescent, Denny on May 29. He also pled guilty to possessing heroin at his 29 Little Denny Road, Denny home on May 30. Michael Maguire, procurator fiscal depute, said: “Police approached the accused on the assumption there was a live warrant in relation to him. The accused confirmed his name and was then arrested. Both officers placed their hands on the accused, holding an arm each. The accused tensed and then struggled with police officers, trying to break free from their grasp. “The accused then fell to the ground while both officers held his arms at his sides and handcuffs were applied while he was on the ground. he was still struggling, making biting gestures towards the officers. “He was lifted back up an then searched. From his right trouser pocket police found two brown resinous blocks and from the left they found scales and a mobile phone. “When he was asked about it he told officers ‘it looks like hash to me’. “The accused was taken hold of in the attempt to stop him escaping and he bit one officer on the upper part of his left arm, breaking the skin and causing minor bleeding. When McAteer, who was carrying 145 grammes of cannabis worth a street value of around £750, sobered up he said she was sorry for attacking the officers. Defence solicitor Simon Hutchison said: “He is most embarrassed, distressed and shocked by his behaviour. He is 42 and has never had any convictions for violence before. “It was entirely out of his usual pattern of behaviour. Mr Hutchison added McAteer had been supplying drugs to his friends to fund his own habit and had not made a profit out of it. Sheriff Derek Livingston placed McAteer on a supervised community service order for two years with the condition he complete 170 hours unpaid work within six months. He was also made subject to a three-month restriction of liberty order to stay in his home between the hours of 7pm and 7am.